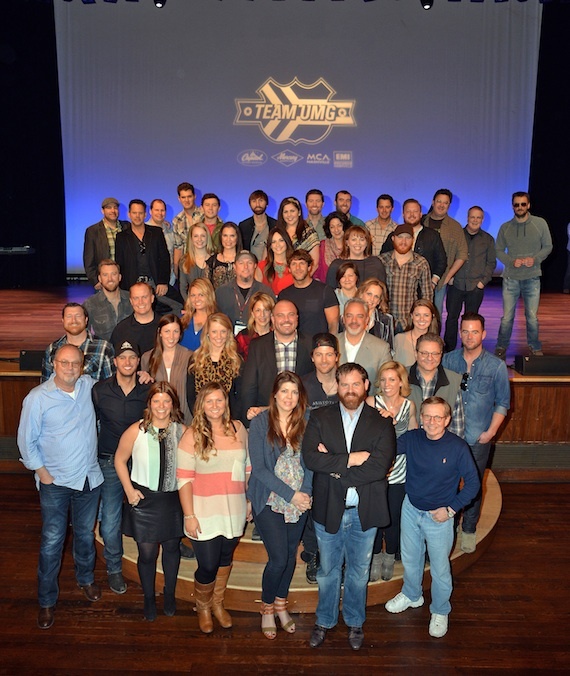 If you come to Country Radio Seminar for the love of music—and despite the industry’s reputation, many people do—the one essential show is the annual “Team UMG at The Ryman.” For two blessed hours, the attendees do not talk. The artists perform unamplified, which reveals who the real singers and players are. And the star lineup is blindingly great. The fifth annual such extravaganza took place on Wednesday (2/19). We picked up our box lunches in the Convention Center and headed for the Ryman. Doors opened at noon. Showtime was 12:30. “Seventeen artists, one song each, acoustic … in the best musical venue in the country,” said host-with-the-most Royce Risser. What’s not to like? Little Big Town was artist #1. “Thank you to all of you for giving us the best year of our lives,” said the group’s Karen Fairchild. The foursome’s harmony-drenched delivery of “Sober” was nothing short of gorgeous. Nay, heavenly. Darius Rucker was #2. The new Grammy winner and 2012 Opry cast inductee gave the crowd a bouncy, smiley “Radio.” It was the perfect song for this crowd. Dierks Bentley, artist #4, was also timely. His new Riser CD ships next week. Royce pronounced it “Risser” for laughs, but pointed out that Dierks has had 10 No. 1 singles. The star sang his CD’s title track and “cornerstone” song, which was superbly moody, atmospheric and inspiring. Then he tossed his guitar pick into the crowd. Easton Corbin was #7. His choice was the choppy, jaunty “Clockwork,” his brand-new single. Lady Antebellum was #8. The six-time Grammy honorees sang the fluid, bopping and harmony embellished “Compass,” which is addictively infectious. I predict a ninth No. 1 hit. David Nail was #10. This guy is one of the best singers this format has, fully in command of his searing, emotional tenor delivery. And he proved it with an awesome, masterful performance of “The Secret.” This was a heart-stopping, hold-your-breath moment. Kip Moore was #11. He had three No. 1 hits in a row from his debut album. “I was backstage thinking about being here three years ago,” he told the crowd. “I’m here to tell you that you guys have changed my life. Without this [performing music], my soul would be dead.” He was urgent, passionate and gripping while singing “Young Love” with just his own guitar accompaniment. Josh Turner was #12. He said he didn’t want to sing one of his hits and wasn’t ready to sing any of the songs he’s currently recording. “When in doubt, play George Jones,” he concluded. Josh launched into a joyous version of “One Woman Man,” confidently dipping into the deepest notes of the song’s verses. “I cannot wait to hear his voice when he finally hits puberty,” quipped Royce. Josh drew the day’s first standing ovation. Kacey Musgraves, a.k.a. #13, is MusicRow’s Breakout Artist of the Year honoree and now a two-time Grammy winner for country album and single. The singer-songwriter was heart-rending and lovely on her sweet/sad waltz of romantic convenience, “It Is What It Is.” This has always been my wish for a single from her CD. Gary Allan was #14. His anguished performance of “It Ain’t the Whiskey” was one more show highlight. 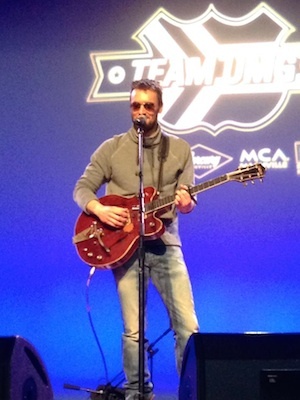 Eric Church was #15. “The Chief” drew a huge, extended cheer following his drawling, stark, soulful ballad “Like a Wrecking Ball.” This was the third solo, guitar-vocal performance of the day. Vince Gill, #16, drew a standing ovation before he even sang a note. The 20-time Grammy winner introduced steel guitar great Paul Franklin. They did Buck Owens’ “Together Again” and Merle Haggard’s “I Can’t Be Myself” from their Bakersfield album. “After 25 years with the label, I get to do two songs,” he explained. 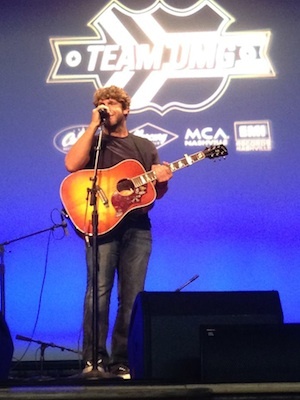 “Team UMG” is actually Nashville’s mega label. Those 17 artists appear on the MCA, Mercury, Capitol and EMI imprints. So no wonder the entire CRS convention wants to be there for its star-studded event. Here’s the hilarious part: When they open the doors, everyone streams into the ground floor, eager to get the “best” seats. Ha! Only tourists and conventioneers think the main floor is the best place to be in this particular venue. Which is why the savvy attendees and the Nashville industry mavens are upstairs in the Ryman—Clay Myers, Dan Hill, Jewel Coburn, Leslie Fram, Doug Casmus, Tom Lord, Walter Campbell, Chuck Aly, Ken Tucker, Jason Morris, Dale Bobo, Andrew Kintz, Steve Lowery, Cindy Owen, Barry Coburn, Regina Stuve, Donna Hughes and the like. My personal favorite spot is five or six rows back, slightly off center up there. Even UMG benevolent overlord Mike Dungan, the biggest “star” there, sat in the balcony with the rest of us. Why not? “Best seats in the house,” he explained.